This is another one of those recipes that I've wanted to make for a long time, but have somehow never got around to it. A few times, I've gone to the shop with the express reason of getting the ingredients, only to find there wasn't any nice looking Fresh Coriander, and so have ended up buying a couple of Leeks and Potatoes and making that soup instead. I don't ever remember having this soup as a child, so couldn't just steal my mum's recipe on this one. In fact, I think the first time I ever tried this soup was when a friend had a carton of the Covent Garden Soup Company version in the fridge. Searching for a recipe on Google revealed lots of different variations on ingredients and preparation methods. A lot of the more 'British' sounding recipes seemed to keep things relatively simple, and just have the one clove of Garlic and relatively small quantities of Fresh Coriander (obviously from people who buy their Coriander in the Supermarket, rather than getting big cheap bunches from alternative retail outlets). Recipes from sites with a more Asian flare seemed to go for a lot more Garlic and Coriander, plus a few additional ingredients and in some cases, a much more complex preparation method. There were also versions which included Tomatoes, others used Sweet Potatoes instead of Potatoes (and some no potato at all) and lots which called for the addition of Single or Double Cream, something I would maybe do if cooking it as a starter for a meal where health factors are not an issue, but as I predominantly made this Soup to take into work in a Flask for a healthy lunch, it was left out this time. However, I did add a little Semi-Skimmed Milk at the end as the soup was quite dark in colour and I wanted to lighten it up a bit. With so many variations, I decided to try and go somewhere in the middle of them with my version, but with Coriander being one of my favourite herbs, there would definitely be a lot of it in there. I did think about using Sweet Potato rather than normal Potato, but I didn't want to make it too sweet, so for this first attempt at this soup, they're just normal white potatoes (in this case, a few small Vivaldi Potatoes). Heat the Oil in a heavy based pan, then fry the Onion, Celery and Garlic on a medium heat for about 5 minutes, until the Onion is translucent. Next add the Carrot, Fresh Coriander Stalks and Potato and continue to cook for another 5 minutes. Add the dried Spices and stir into the vegetables so that they're all nicely coated, then add the Stock and Bay Leaves, bring to the boil, then simmer for about 30 minutes, until the vegetables are tender. Let it cool down a bit, then blend until you have a nice smooth soup. Add the remaining Fresh Coriander Leaves and gently reheat the soup (without boiling). My soup was darker than I'd like, so added about half a cup of Semi-Skimmed Milk at the end to lighten the colour a little, but this is definitely optional. 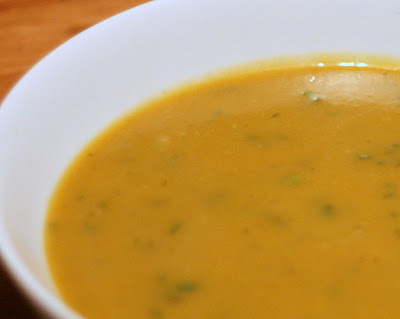 I'm trying out your carrot, leek & potato soup on my boyfriend tonight - must try the carrot & coriander another night! Wonderful blog, I happened upon it by chance and I'm bookmarking it to come back! What a great combination of flavors. We're growing several varieties of carrots now and look forward to trying out your recipe when harvest comes around!